It’s hard to believe but it’s now twenty years since A Line in the Sand was published in hardback. I remember it coming out in January and a check of Amazon UK confirms it was published on 2 January 1999. It was Gerald Seymour’s eighteenth novel so it’s sits halfway between Harry’s Game and the latest book Battle Sight Zero. A Line In the Sand was the story of a man who had given information to the intelligence services which lead to the deaths of people working on Iranian weapons programs. He’s given a new identity back in England. However the Iranians find out where he is an send an assassin to take revenge. It was later adapted as a TV drama with Ross Kemp. 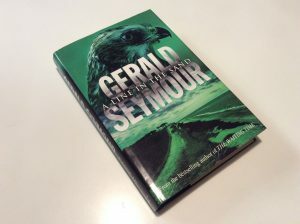 On a personal note this was one of the few Gerald Seymour novels I didn’t have a hardback copy of as I had bought the book as a trade paperback. Recently I got a hardback copy (via a popular internet auction site). Only then I realised I was buying my copy exactly twenty years late. Hopefully I’ll be able to get around to revisiting the book with my nice “new” hardback sometime this year. 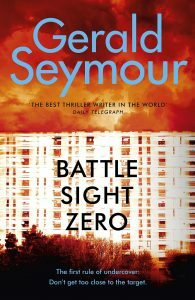 Just a quick reminder that Gerald Seymour’s latest novel titled Battle Sight Zero is officially published in hardback and paperback today in the UK. My review can be found on the Battle Sight Zero page. My review page for the new novel Battle Sight Zero has now been added to the site. Thanks as always to Hodder books for the advance review copy. Oops. I missed the paperback publication date of A Damned Serious Business. It was officially published in the UK on 1 November, so I’m only one day out. This one is well worth a look and is particularly timely dealing with Russian cyberwarfare. There is a new cold war raging and its frontline warriors are Russian hackers – gang-members working freelance for the FSB, successor to the KGB. Massive thefts of personal information, electoral interference, catastrophic disruption of commercial and social services, banks, airlines, even whole countries disabled – this is happening now. Nicknamed ‘Boot’ because of his obsession with the Duke of Wellington and the battle of Waterloo, Edwin Coker is a case officer at the Vauxhall headquarters of MI6. When a young hacker falls into his hands and reveals details of a secret meeting, Boot conceives a daring plan to strike back – not with a computer virus of his own, but with a bomb that will seriously damage the Russian operation, spreading fear and distrust. Now Boot and his little team need a ‘deniable’ handler to deliver the explosives across the border from Estonia into Russia and bring the hacker back out. They turn to Merc, an ex-soldier fighting in Iraq, a gun-for-hire who knows how to get out of a tight spot. They hope. From the moment Merc sets out to cross the River Narva things do not go to plan and when the hacker’s sister becomes involved, his mission turns from tough to near impossible. The scene is set for a classic story of pursuit and evasion and an epic battle for survival. 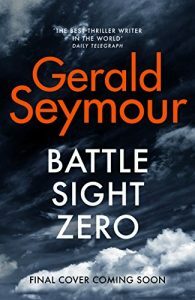 The official Gerald Seymour Facebook account has revealed the cover to the next novel Battle Sight Zero. The book is due to be published in he uk next January. Just spotted this today on the Facebook. 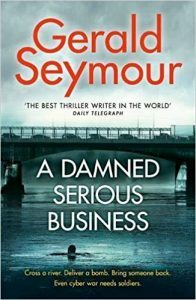 Gerald Seymour will be appearing at the Edinburgh International Book Festival to discuss his latest novel, A Damned Serious Business. The event From Russia with Hackers is on Wednesday August 15, 5.30pm at the Spark Theatre on George Street. Tickets can be bought from the following site. This is something of an oddity that I spotted this week. 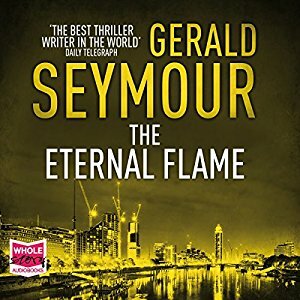 It appears that there is an audio book of a Gerald Seymour short story titled The Eternal Flame. It seems to be out on both Download and CD formats and was apparently released on 28 January. Jonas Merrick – mockingly nicknamed ‘Eternal Flame’ by his colleagues at MI6 because he was desk bound and considered a long redundant encyclopaedia of names and faces – was on the edge of retirement. Having escaped his own insincere retirement party and taken refuge on a bench within the grounds of Thames House, he finds himself sitting next to Winston Gunn, a young man drawn into the Jihadi activist net while serving 18 months imprisonment. A young man packed tightly with explosives ready for detonation…. The latest Gerald Seymour novel was only just published in January but already there’s a listing for next year’s book titled Battle Sight Zero on Amazon.co.uk. A searing novel of trust and betrayal in the fight against terrorism. The Kalashnikov AK47 is a weapon with a unique image, symbol of freedom fighters and terrorists across the globe. In a fanatic’s hands, inside a crowded shopping mall, it can bring death and mutilation to scores of people in a matter of seconds. MI5 have struggled for years to keep this rifle out of Britain. Andy Knight is a young truck driver. Last year he was doing something different and had another name. Next year, if he survives, he’ll be someone else again. That is the dangerous, lonely life of an undercover officer. Andy has befriended Zeinab, a young Muslim student from a small Yorkshire town who is a central part of a murderous, extremist plot. Connections have been made through a veteran Manchester gangster with a source of AK47s in the impoverished, drug-ridden, high rise estates of Marseilles. If Zeinab can find a driver and bring one rifle home on a test run, many more will follow: this is the nightmare scenario for the security forces – with them would come killing on an horrendous scale. Zeinab is both passionate and attractive, and Andy had had drilled into him that the golden rule of undercover work is not to get emotionally close to the target. But, sometimes rules are difficult – impossible – to keep to. Battle Sight Zero follows Andy and Zeinab on their path to the lethal badlands of the French port city, simultaneously tracking the extraordinary life journey of the veteran blood-soaked weapon they are destined to be handed there. Battle Sight Zero is due for publication in hardback from Hodder on 10 January 2019 and is priced at £17.99. Obviously all this can change between then and now. Thanks to Ross for the alert. Sue has reminded me that Gerald Seymour is being interviewed at Rhydypennau library in Cardiff next Wednesday night, 31st January 2018. The event is free entry and he’ll also be selling and signing A Damned Serious Business.